Gigabyte is working on at least 12 motherboards for AMD's Llano, you can find out more at VR Zone. However, it seems like Gigabyte is starting to divide up its products into different sub-categories and although we can understand that the rising price in raw materials have something to do with it, it's getting a little bit confusing for consumers. 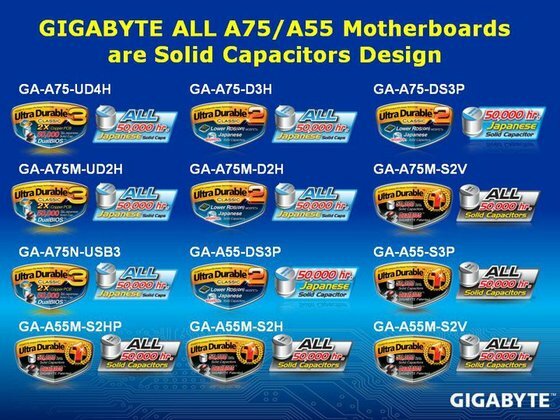 It's not as if Gigabyte is trying to hide the fact that its new Llano boards will fit in to the Ultra Durable 3, Ultra Durable 2 and Ultra Durable 1 sub-categories, but a lot of people wouldn't know what the difference is. There are only three Ultra Durable 3 boards, namely the A75-UD4H, the A75M-UD2H (mATX) and the A75N-USB3 (mini ITX). Of course, if you're an avid VR-Zone reader, you'll already know that we've seen the first two boards, just ahead of Computex, but judging by the slides, a few things have been changed on the A75-UD4H, but more on that a little bit later..